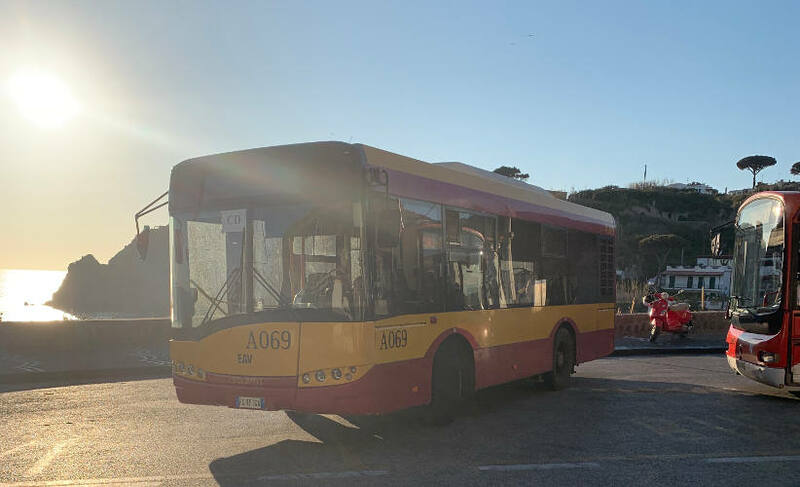 Spare a thought for the public bus fleet drivers on the Italian island of Ischia, who have to negotiate narrow passes and tight corners in the face of an oncoming parade of vehicles often with tourist drivers who are clueless about local traffic rules. Ischia is a paradisical Mediterannean island in the Gulf of Naples, near Capri, and is a popular destination for Italians and Europeans in spring and summer. The island is about 47 square kilometres, dominated by mountains and surrounded by long sandy beaches, sheer cliff faces and rocky coves. The main bus route known as CS (Circumnavigazione Sinistra, or circumnavigate left) follows the 35-kilometre long road around the island, sweeping through the shoreside white-washed villages of Ischia Porto, Casamicciola, Lacco Ameno, and Forio, up to mountainside rustic ones named Serrara Fontana and Burano. It’s in the hilly area around Mont Epomeo, 800 metres above sea level, where the road is pinched by geography and by buildings. Some corners are so tight the bus can’t move forward until the road is cleared of other vehicles. The local traffic rule is to give way to the larger vehicle. That can mean a line of six, 10, or more vehicles will have to get out of the way. That means reversing, sometimes a hundred metres to find a space, such as a private driveway to pull into and give the bus the room it needs to stick to its route and timetable. In the summer, the population of Ischia explodes tenfold. It swells to as many as 600,000, up from the 60,000 local inhabitants who pretty much have the island to themselves in winter — from late December until the end of March when the tourist season begins. With that explosion comes increased traffic. 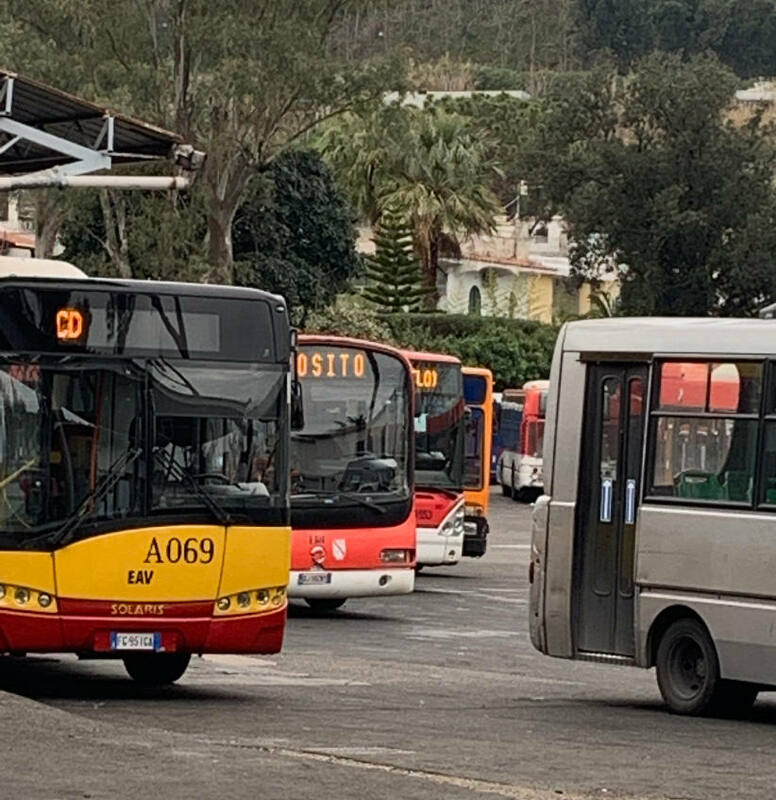 Buses are full, every taxi is on the road, and a lot of European visitors, particularly those from nearby Naples and other parts of Italy bring their own vehicles over from the mainland by ferry. In this peak traffic period, it’s common for the bus to encounter visiting drivers who don’t understand the local rule. You’re probably imagining the scene with drivers jumping out of their cars, waving their hands about screaming at each other, as in the classic stereotype Italian from a movie. That’s not what happens. Bus drivers on Ischia, and local drivers, have tremendous patience in this situation. The bus drivers here are trained to take control of the situation. To meet the increased demand for bus drivers in summer, the local squad is bolstered by bringing drivers over from an affiliated fleet in Naples. It’s a two-hour ride by ferry, or an hour by hydrofoil from Naples to Ischia Porto, where the bus depot is located. There are 17 routes covering some 80 kilometres of the island’s roads, including a CD route or Circumnavigazione Destra, (circumnavigazione right) that travels in the opposite direction of the CS route. When those two buses meet on the tight corners, at least the bus drivers know what to do.